As you may have noticed, posters pertaining to Canadian history have recently been placed around campus. These posters are a part of a public awareness campaign being put on by students in HIST 2783, Canada Since 1867. Its purpose is to spark public interest in our nation’s rich history by highlighting key events, ideas, and individuals that helped to shape Canada. Our group chose to focus on Canada’s involvement in World War I, specifically the contributions of Sir Arthur William Currie. 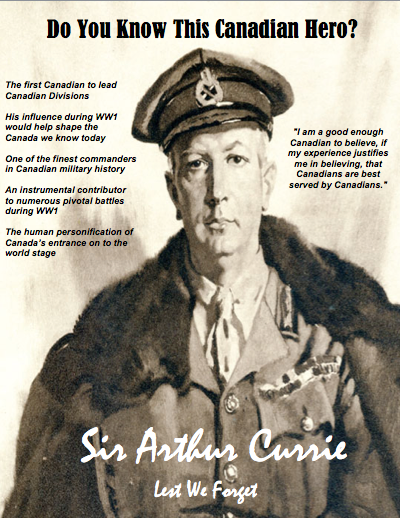 By doing this public awareness campaign, our hope is that as the centennial anniversary of the war progresses, Canadian citizens will be more interested and informed as to why key moments and individuals like Sir Arthur Currie are so important to our history. We cannot permit ourselves to forget the cost and impact of the Great War on Canada. In 1920, Sir Arthur Currie came to campus. He attended convocation and laid the corner stone of the War Memorial Gymnasium. I have written two posts about Currie’s visit on my research blog, Acadia and the War.